People watch over a billion hours of video a day on YouTube. That's over 100,000 years' worth of video watched every single day. So how do you make sure that your video marketing content gets a share of that watch time? By making sure it's optimized for YouTube and Google search. Yea, that's right, videos are playing a bigger part in Google search as well. But the old methods of video SEO don't work anymore. Your title has a huge affect on your video SEO, but not in the way you might expect. According to Backlinko, including an exact match of your target keyword in your title does have a slight affect on video rank, but that correlation is relatively small. Look at the video titles that are already ranking well and see if you can follow a similar formula for your title. Spend some time on it. Your title is arguably the most important part of the content you're creating. After all, if nobody clicks on your title, nobody will see your content anyway. We often see people try to create the title quickly when it deserves far more time than just a couple of minutes. Bounce ideas off other people. Sometimes all it takes is a little creative collaboration. Test and optimize. Try a bunch of different types of titles for similar videos and see what drives a higher CTR. Deceiving or misleading: Misrepresents the content of the video. Shocking: Includes offensive or outrageous language. Disgusting: Contains gross or repulsive imagery. Gratuitous violence: Unnecessarily promotes violence or abuse. Indecent: Implies sexually suggestive or lewd content. Loud: Uses ALL CAPS or !!!!! to overemphasize titles. Your video thumbnails matter for the same reason that your titles do - they should be compelling and cause users to want to click on them more than other videos. Just remember that the list of rules in the titles section above applies to thumbnails as well. Spend some time creating a custom thumbnail that's visually appealing, speaks to what your video will cover, and catches people's attention. 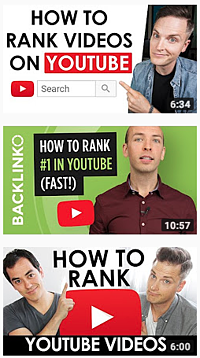 The image to the right shows the top three thumbnails for the YouTube search, "YouTube SEO Tips." There is one exception to this - if your video includes someone famous or some awesome action shots, you can and should just use an image from the video. That image will be compelling, simple, and authentic - a winning combination. Contrary to what you may have heard, keywords no longer matter in your YouTube descriptions. In fact, in that same Backlinko study, they found zero correlation between keyword-optimized descriptions and rankings for that term. So why do descriptions still matter? For two reasons. First, the first 125 characters of your description appears in the search results. If you can grab people's attention with the beginning of your description, your CTR will improve. Second, while YouTube might not care about exact keyword-matching in descriptions, they are likely still using the description to learn about the context of the video. Make sure you're writing a long (200+ words) and accurate description to provide as much context as possible. If you've ever taken a look at the automatic transcripts YouTube creates for your videos, you can tell that they aren't very good yet at accurately being able to tell what your video is about just from that video's audio. You need to help them out by uploading an accurate transcript of your video. And, in case it wasn't obvious, your video should be about the keyword you're optimizing for - so your transcript should include that keyword and related terms as well. Just make sure it's an accurate transcript and that you aren't just repeating your keyword over and over. Speechpad, along with other transcription tools, can help you streamline this process. YouTube cares A LOT about keeping people on their platform. Help them do that, and they'll reward you with high rankings. There's two things you need to do to keep people watching. Create a compelling opening that gets to the point quickly. If someone searches for "how to setup quickbooks" and you spend the first 20 seconds talking about your accounting firm, people aren't going to stick around. Nail the basics. Would you watch a video with uninteresting content, poor audio quality, low video quality, or bad lighting? Nobody else will either. 68.2% of videos on the first page of YouTube are in HD. If you're worried about how much it costs to produce a high quality video, check out our post on our favorite equipment for cheap video production. Find ways to shake things up. If your video sounds and looks the same all the way through, people will get bored. Think about ways you can add in some humor, switch up the pace, or give your audience a change in scenery. Even if it's only for a moment, these things will go a long way towards helping you keep your audience's attention. Create longer videos. Most people think that all online videos should be short. But do a few searches on YouTube and you'll find that most of the top videos are actually longer videos. As long as you can keep people watching, a longer video is likely to outperform a shorter one. Pay attention to your analytics. Watch your YouTube analytics or use an even more powerful video analytics platform like Wistia to learn about your audience's reaction to things you do in your videos. Where are people dropping off? Are there certain phrases or topics that are particularly engaging or that push viewers away? You should be constantly monitoring, learning, and improving. Organize the content on your channel by creating series playlists made up of videos that make sense to watch together. Create a regular release schedule for your videos when uploading to encourage viewers to watch sets of videos over single videos. Use the end card on your video to drive viewers to another relevant video. This one is pretty obvious, if people are watching, liking, sharing, and commenting on your video and subscribing to your channel, YouTube and Google are going to give them priority. There are a lot of tactics to get people to engage, but there are two that are guaranteed to work every time. They're easy in theory but take quite a bit of work in practice. To get people to engage, be engaging. You should sound like you're talking to a real person in your video and don't be afraid to ask questions or include a call-to-action for channel subscriptions or shares. In the comments section, make sure you're replying to the comments so you can foster a conversation. Promote, promote, promote. View count matters a lot for rankings. Unless you promote your video through things like your email list, forums, your website, backlink building, and more, getting enough views to rank well will be extremely difficult. Want more ideas to get the maximum number of shares for your videos? Check out our post on the science behind viral video content! In 2018 and beyond, things like content quality and video engagement will be far more important than simply including keywords in your video description. If you haven't already, put all of your effort into getting people to click on, keep watching, and engage with your videos and you'll be set. Have you had luck with other ways of getting your videos to rank? Let us know in the comments below!